Our school app, launched last year, is another way to keep up to date with the latest news, announcements and key dates from Johnstone High. Smartphone users can get the app on their phone by clicking the relevant link below. The first step is to get mySchoolApp on your phone. The easiest way, is to use your phone to search on the Play Store for mySchoolApp. It’s the one below with the multicoloured app tile featuring our stickboy. When you have downloaded mySchoolApp to your device (phone or tablet) there are just a few things you need to do, to ensure you can get the most from the app. On the screen with the Apple start to enter the school name. Once you have entered a few letters, the app will give you some suggestions. Tap on the correct school name and you’re logged in. You only have to do this once, mySchoolApp remember your school automatically in future. When you have selected your school you will be required to enter your details. This is a once only form and enables the app to identify you to the school. The school app administrator will be able to see your name, email and phone number. We also request you create a PIN, which is private. This will be used if you submit an absence notification via the app, ensuring only you can use this feature. From the app menu, select Settings. Push notifications enable the school to notify you of new messages or events without the need for you to actually open the app. It is recommended that you choose to accept push notifications from mySchoolApp, to ensure that you recieve important communications, such as a school closure due to snow or a late coach return, etc. If your school has created notification groups you will see these in settings. Simply opt in, to receive notifications from the groups which are of interest to you. This function enables the school to send messages to specific year groups or sports teams for example. The first step is to get mySchoolApp on your iPhone. The easiest way, is to use your phone to search on the App Store (Apple) for mySchoolApp. It’s the one below with the multicoloured app tile featuring our stickboy. 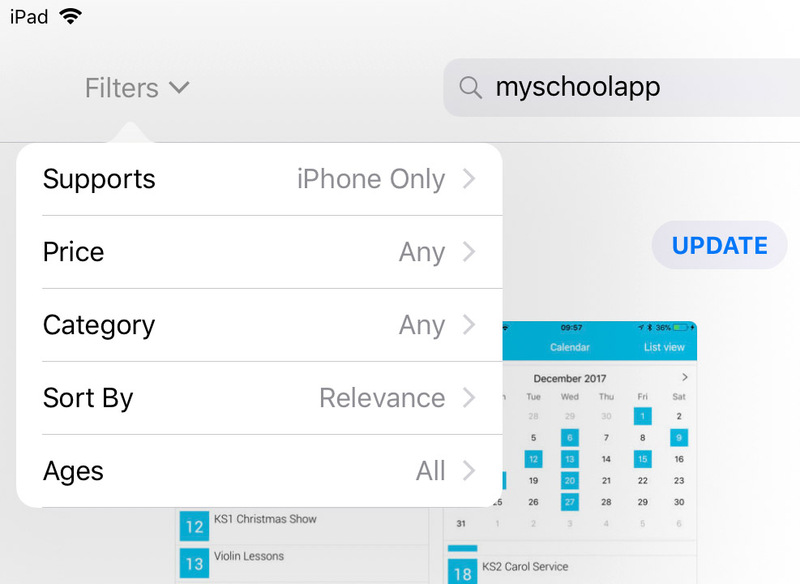 When you have downloaded mySchoolApp to your device (iPhone or iPad) there are just a few things you need to do, to ensure you can get the most from the app. To install mySchoolApp on your iPad please follow this guide. Tap on Filters in the top left of the screen. mySchoolApp will now be listed in the results.